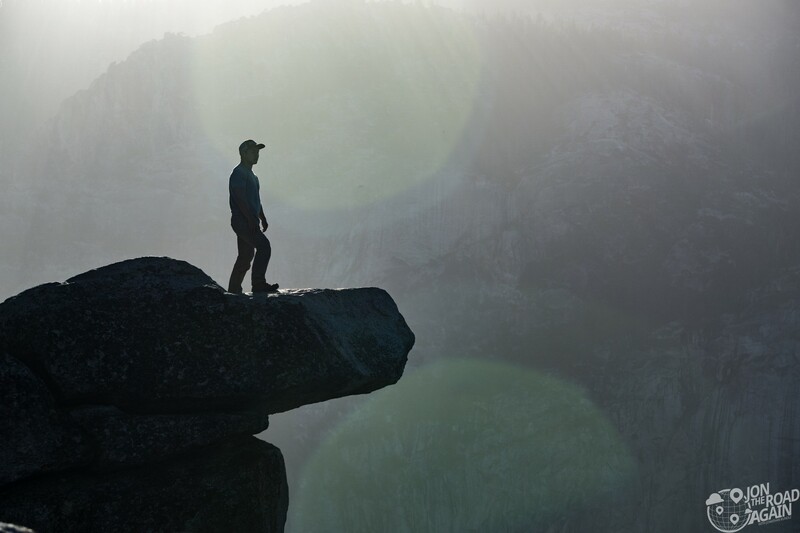 Glacier Point is the crown jewel viewpoint of Yosemite National Park. 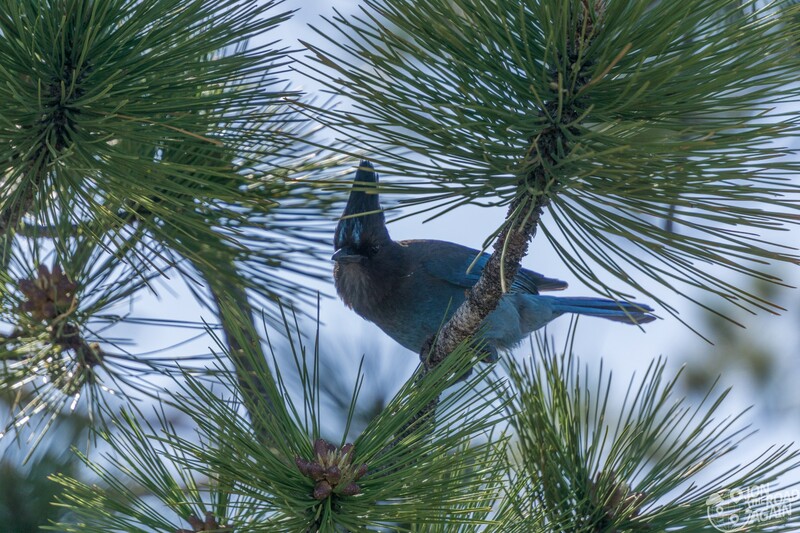 With it’s commanding view of Yosemite Valley and all of the famous sites nearby, this is a can’t miss stop on your visit to Yosemite. 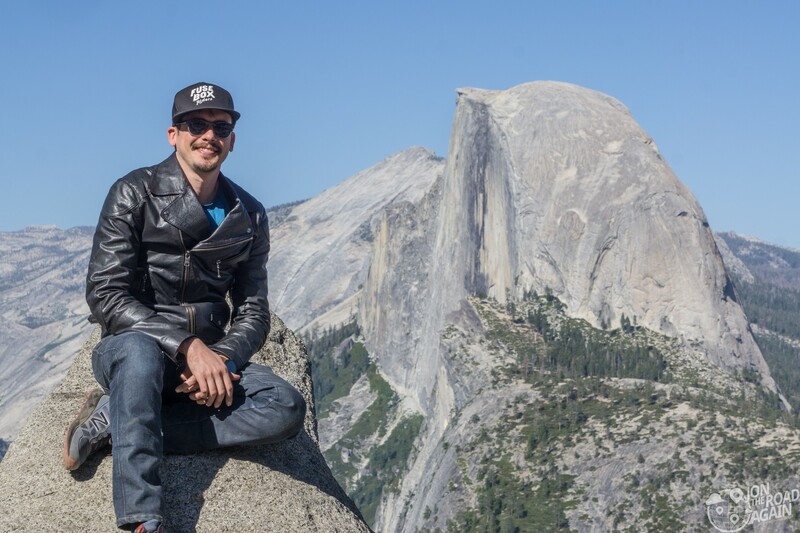 As a couple of motorcyclists, the road into Glacier Point (and nearby Washburn Point) is tons of fun. I wish your journey RV-free. If not, take advantage of the turnouts and let some space develop between the cars ahead. You’ll enjoy the twisties that much more. 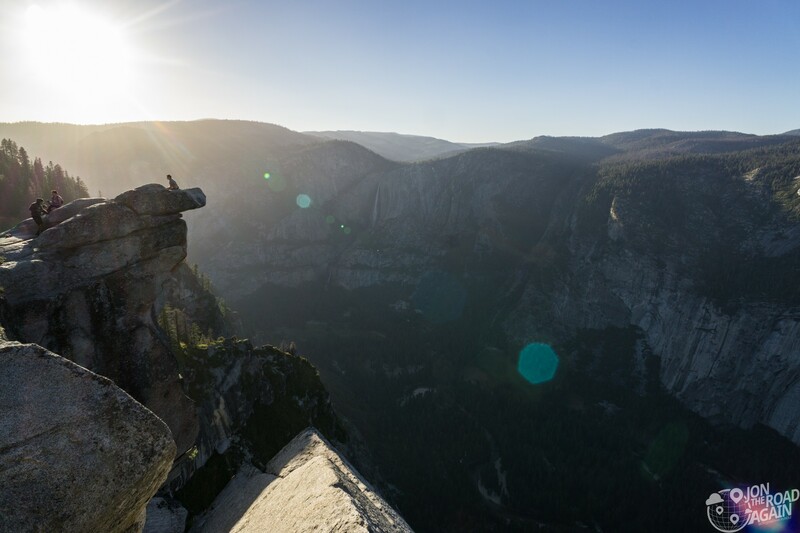 At the top, the final hairpin into Glacier Point opens up to a wide open view with Half Dome front and center. It can get pretty crowded here, so expect some traffic stacking up even into this hairpin turn. The short walk from the parking lot to the incredible overlook has a little something to do with the popularity. With virtually zero effort, you’re granted access to the greatest view in the park. 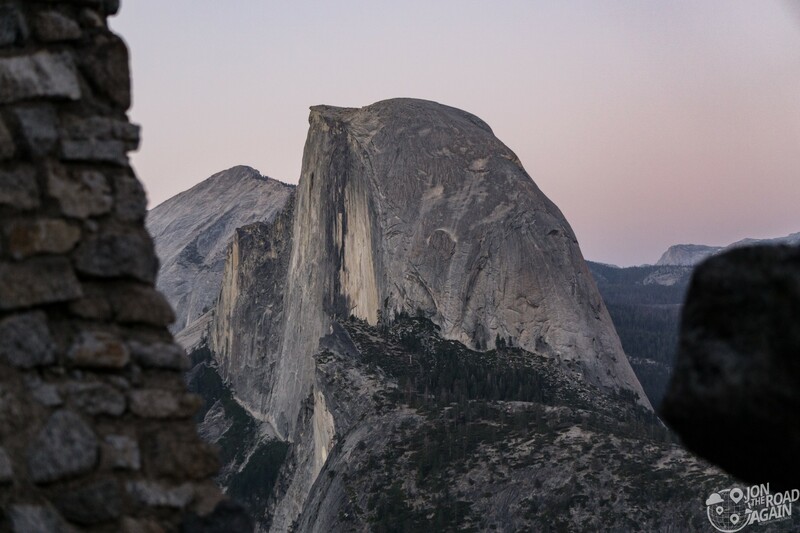 I would bet climbing to the top of Half Dome provides an incredible view, too. But it’s kind of like visiting the top of the Empire State Building. It’s beautiful, sure; but you’re missing the most iconic building from the skyline. 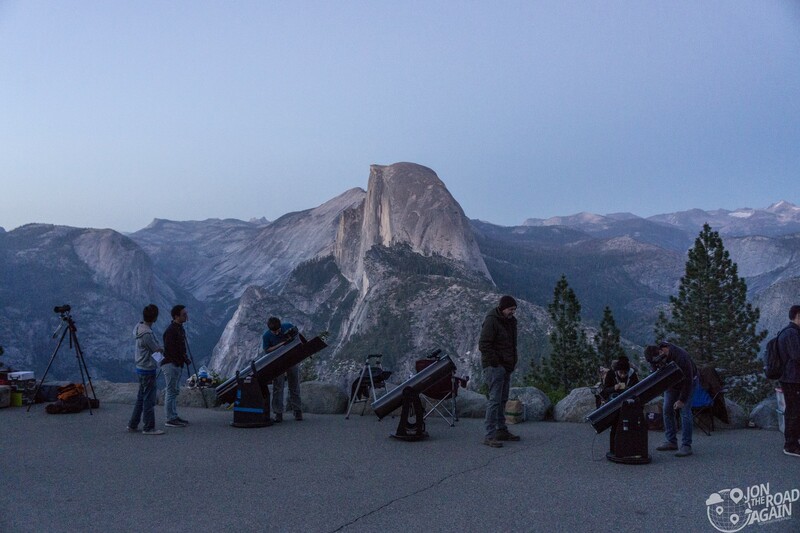 In this panorama, you can see all of Yosemite Valley, Upper and Lower Yosemite Fall, North Dome, Basket Dome, Tenaya Canyon, Polly Dome, Half Dome, and more. Vernal Fall and Nevada Fall of the Mist Trail are off to the right out of frame. Yosemite Falls is a tiered waterfall with a total drop of 2,425 feet – that’s good enough for the 20th tallest waterfall in the world. 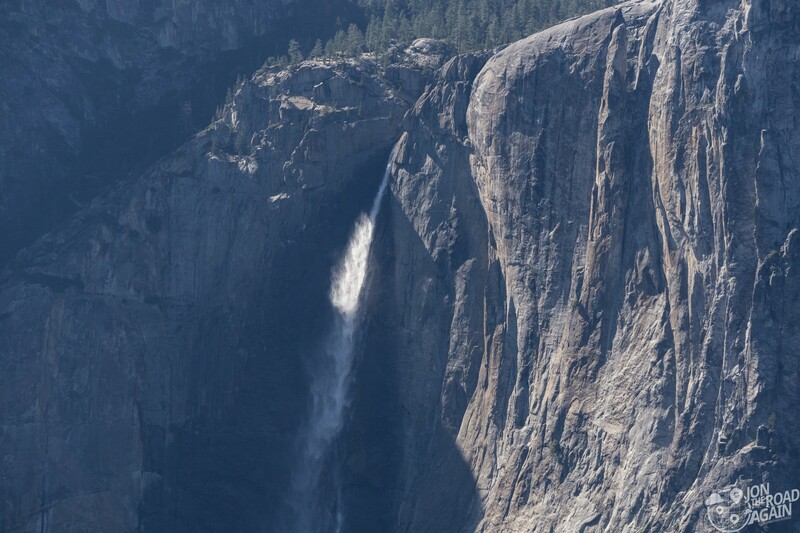 Upper Yosemite Fall, at 1,430 ft is by itself enough to rank 14th tallest. 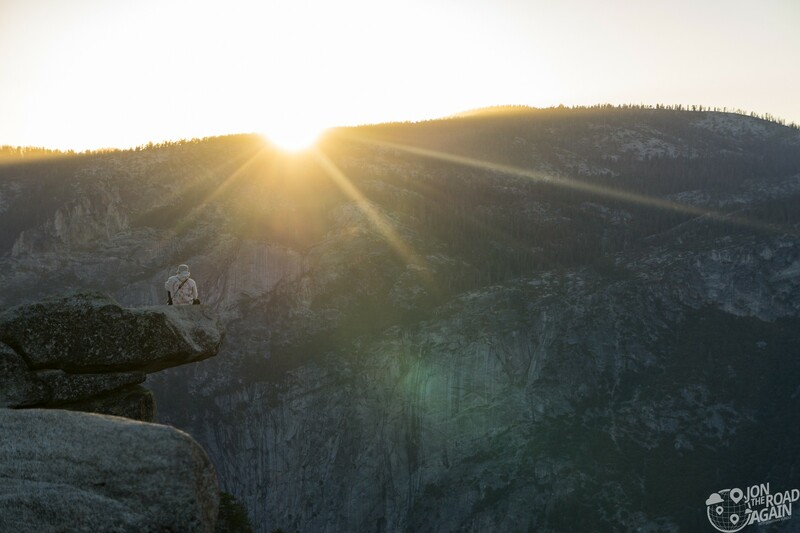 The sun cuts into the valley and catches the mist coming off of Upper Yosemite Fall. 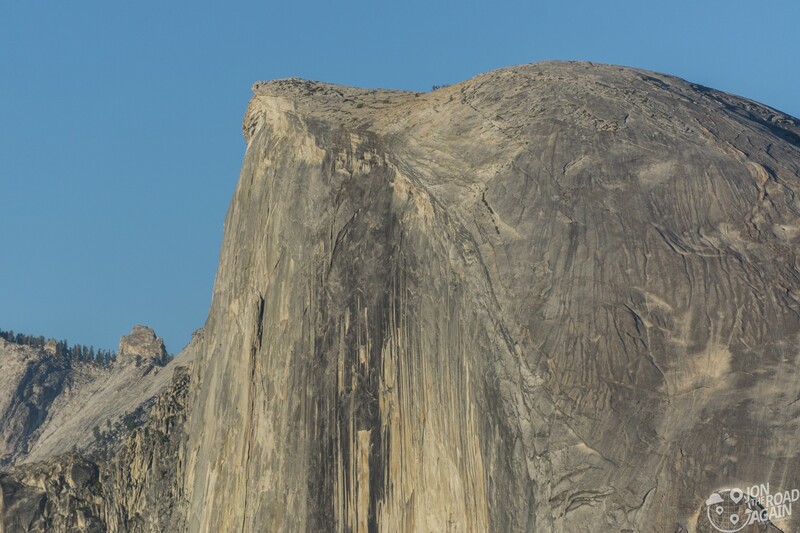 Half dome is the star of the view. 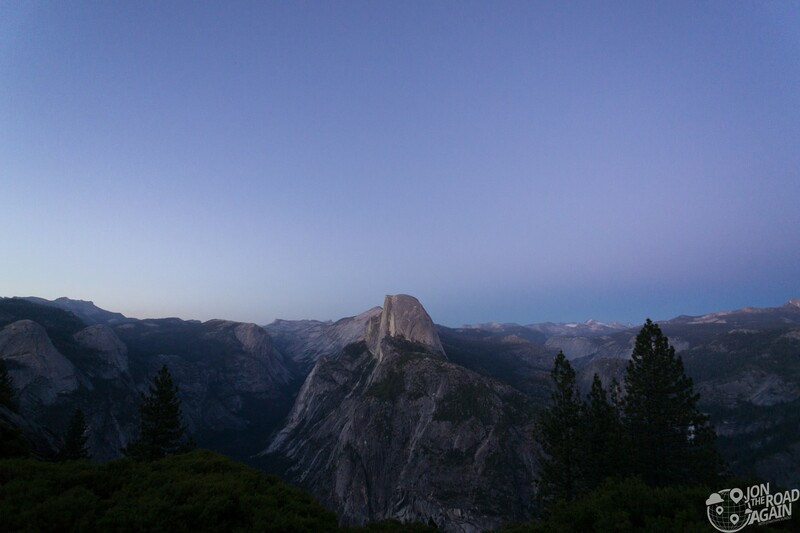 As I mentioned before, the Empire State Building of the Yosemite skyline. 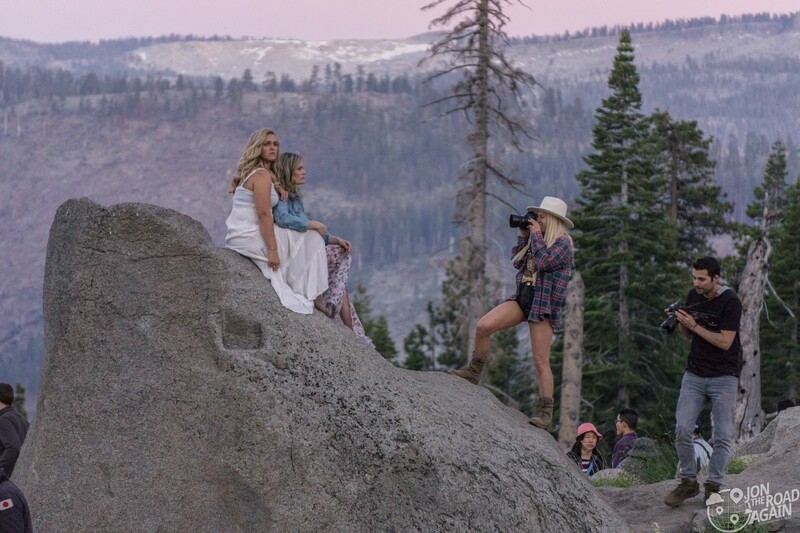 What would this life be if we didn’t get our photos taken with Half Dome in the background? The line to sit on this little rock formation was pretty long when we got there. 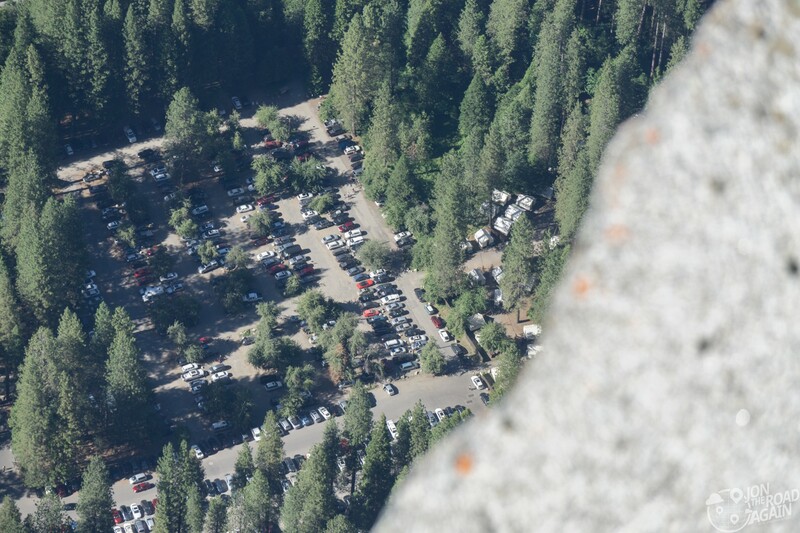 But I waited my turn and got the photo everyone else at Glacier Point also took. Once the sun set, there was a more “professional” photo shoot bogarting the rock. I hope no one else wanted to take their photo on that rock at the perfect time of day! We’ve got Instagram followers to impress over here! One of my favorite items that I buy at the national park gift shops are reproduction US Geological Survey markers. When you get to see the real thing in person, I personally think it’s a real treat. 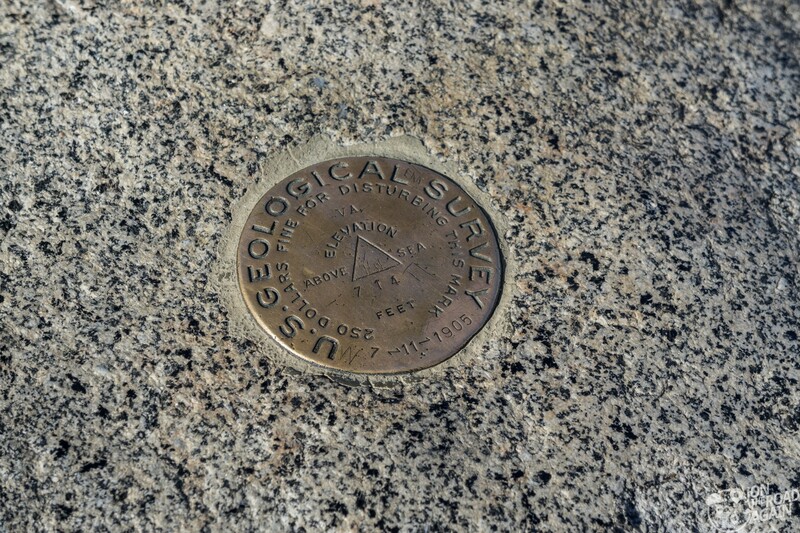 7-11-1905, 7,214 feet above sea level. I wasn’t brave enough to go climb out on this rock. The park asks you not to, actually, but there were some pretty epic photos to be taken over there! This guys wins the posing contest. Oh, but it is a very long way down. I always love taking some time to listen to the park ranger give a talk (see Glacier National Park). This one was great (as they all have been) and the ranger really hung in there with all the stupid responses to his questions. It should come as no surprise that some people are really clueless about the park they’re visiting. A least read the free map they give you at the entrance station a little! At least they’re here to see and learn, I guess. Built in the 1920s as the first trail side “museum” in a national park, the Geology Hut has the best perch of any structure in the park system. “Nature Guides” served at the hut and shared their knowledge with tourists. 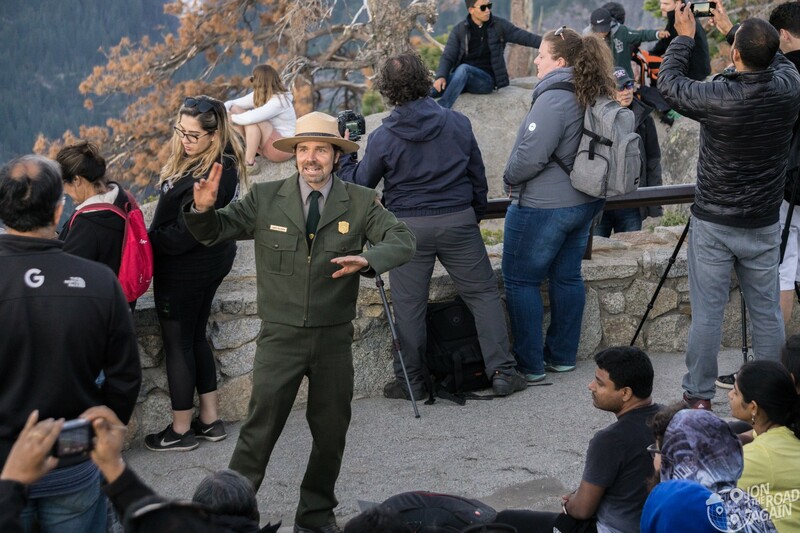 Those guides were the first official interpreters in the national park system. This little guy was enjoying the view near the hut, too. 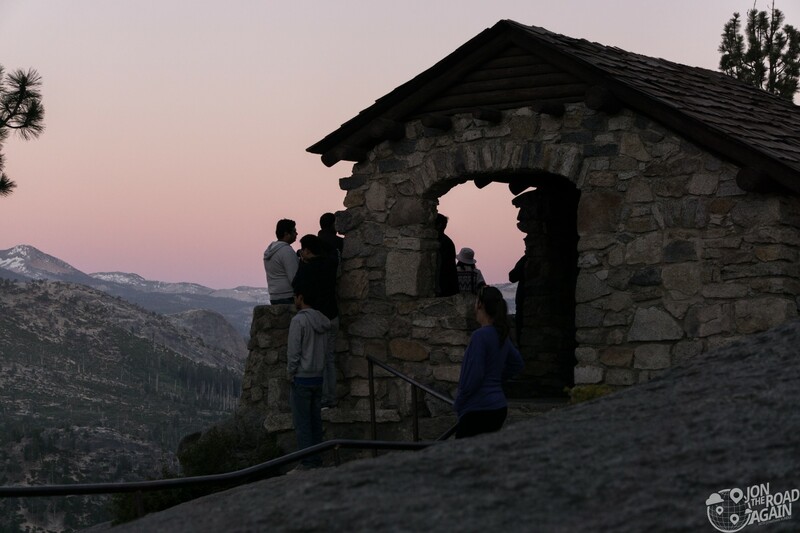 Glacier Point is all about the sunset. Last night we watched the sunset from Tunnel View Overlook and while that was breathtaking, it’s got nothing on this scene. 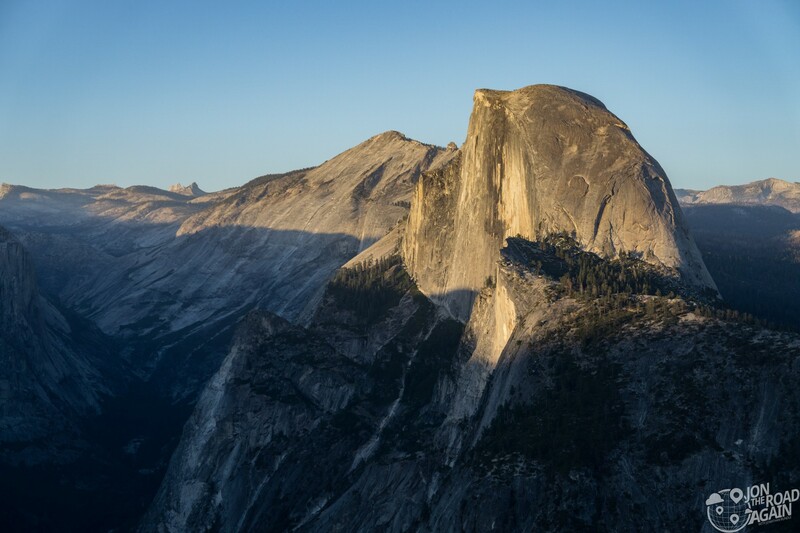 The sun dips and gets it’s last touches of light to Half Dome and Cloud’s Rest – the peak just behind Half Dome. 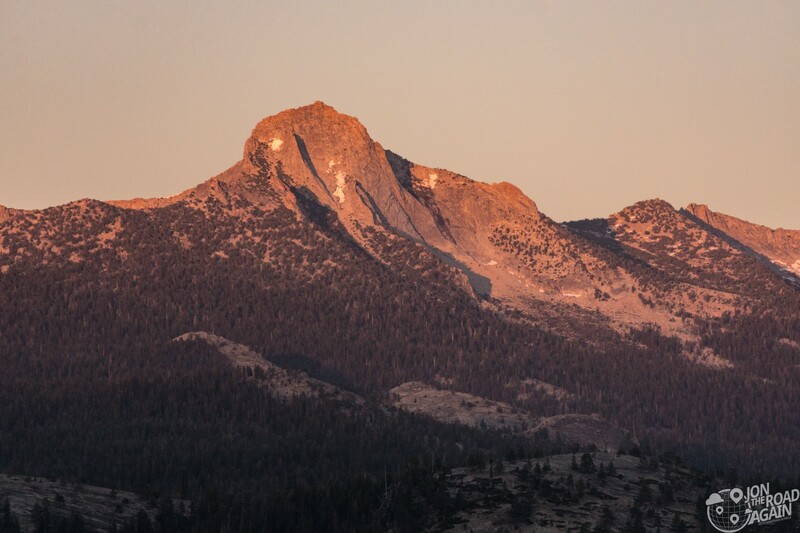 The very last bits of light hit Mount Clark. Just after the ranger talk given at the main overlook, the evening program continues at the amphitheater. Tonight’s evening program is all about the stars. The local astronomy club has taken over the area and are allowing people to look into their telescopes. 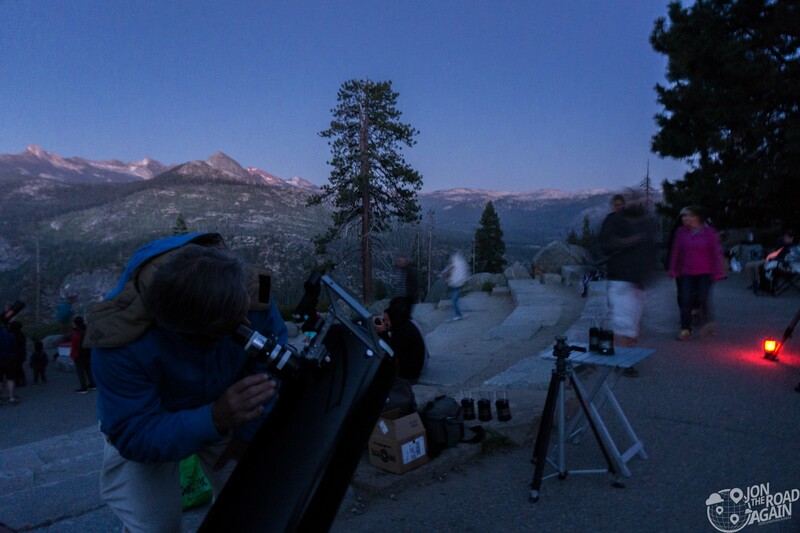 The park ranger gave a short introduction and we were invited to find an amateur astronomer to take a look. We saw Jupiter and it’s moons before deciding it was time to head back. If it wasn’t going to be another 2+ hours before we made it back to our accommodations, we would’ve stayed longer to get the full under-the-stars effect. Even so, we’ll roll in a little after midnight. Plus, it’s cold up here! On the walk out, I seriously couldn’t stop turning around to get my last looks of Half Dome. What a sight. 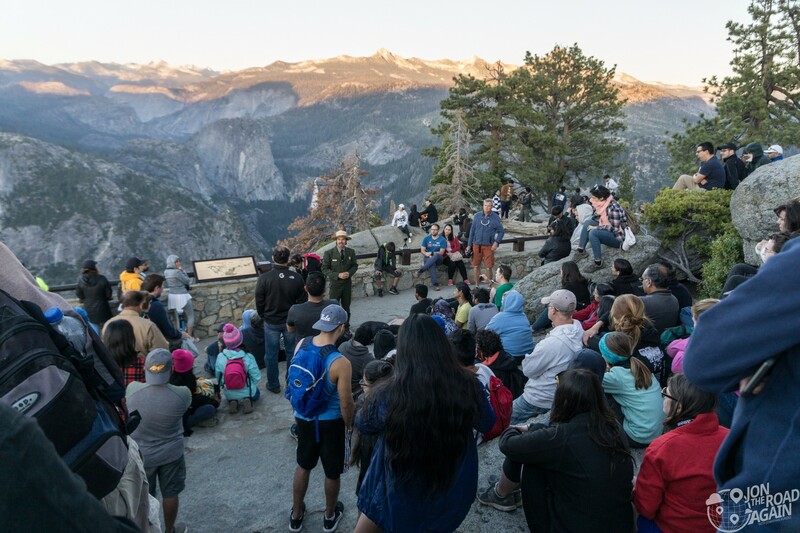 Glacier Point Road is usually open from June through October. 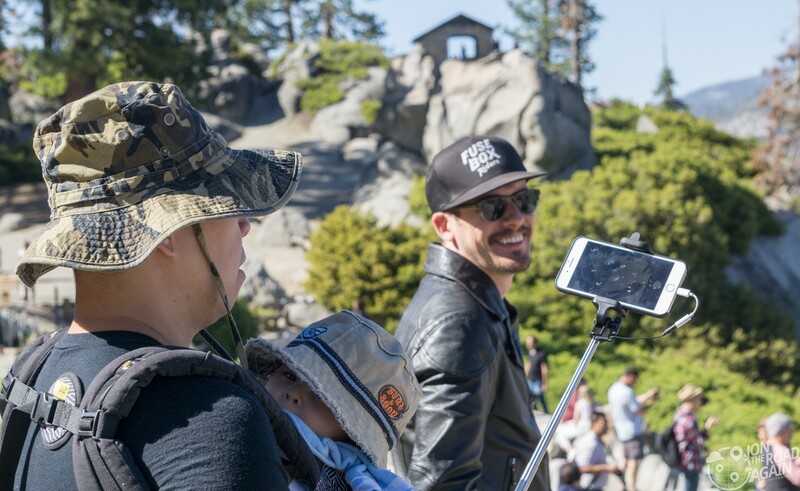 In winter, Glacier Point Road closes due to snow, and access to Glacier Point from the Badger Pass Ski Area is only by ski or snowshoe. You can hike here, too. 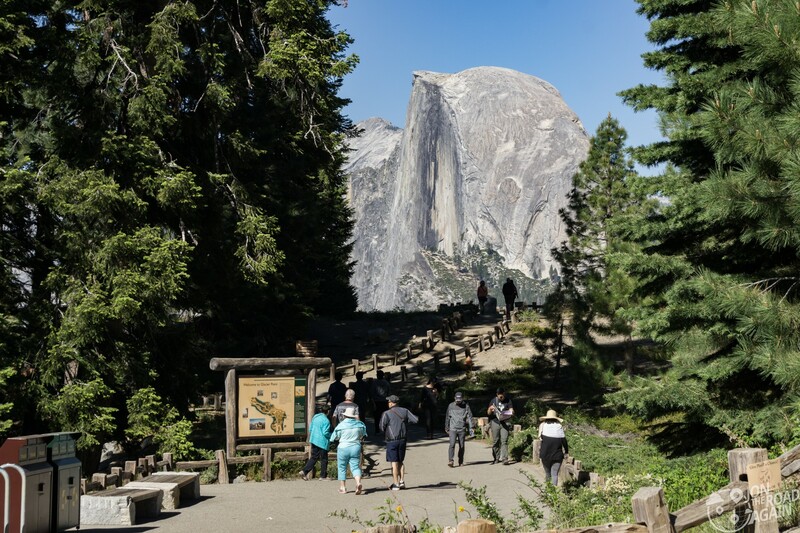 Using the Four Mile Trail, you can ascend 3,200 feet in 4.6 miles. You’ll have to read about that elsewhere as I am a motorcyclist and not a hiker. So beautiful, Mom and I will have to visit there some day. We are so glad you are able to experience these natural wonders! As always beautifully photographed and presented! Beautiful (The guy out on the rock ledge is nuts ) Thanks for the ride It really is so beautiful !! !